There are red velvet cakes, and then there are Red Velvet Cakes. In the past five years, that staple of Southern cooks has been co-opted by trendy websites, blogs, magazines, chain restaurants, and cooking shows. Somewhere along the way, the original recipe has permutated. I, myself, have adapted the recipe that was passed on to me by My Mother, who got it in the 1950s from her sister who lives in Atlanta. Turns out, it may not have originated in the South at all. As in religion, mythology explains the creation of something. It doesn’t mean it isn’t true, it only posits a basis for everything that came after. A search on Google shows as much speculation about Red Velvet’s origins as it does about its ingredients. Some say it is based on so-called “velvet” cakes of the 19th century, which incorporated a little cocoa or almond flour to soften a cake’s texture. Some say that the characteristic “red” color began with the redness of the cocoa or that of the brown sugar that was used. Some say it originated at the Waldorf-Astoria. Some say it originated at Eaton’s Department store in Toronto. Some say its current incarnation was promoted by the Adams Extract company in Texas. 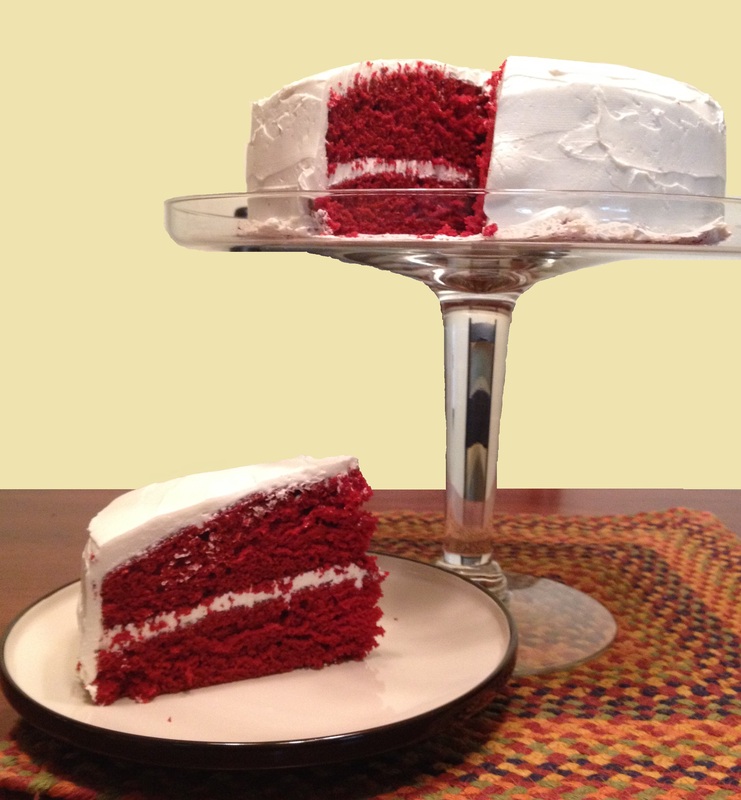 As with religion, no one can agree, so I’ll stick with my own lore of what a Red Velvet Cake should be, how it should look, and how it should taste. I simply NEVER buy one in a bakery or restaurant, because they never correspond with the mythological essence stored in my brain. I am a Red Velvet connoisseur. I’ve been eating them for over 50 years. It is my birthday cake of choice, and a birthday cake should always be exactly what I expect it to be when the fork hits my mouth. The red color has always been controversial. Before anyone was talking about carcinogens in food, one of my fourth grade classmates objected to the Red Velvet cupcakes that my mother sent to my class in honor of my 10th birthday, in 1962. “EWWW!! !” Teddy Rollo (name changed to protect the innocent) shrieked, after biting into one. “It’s OX BLOOD!! !” He dropped it on the floor. “No, it isn’t!” I shouted at him, as kids all over the classroom spit out my favorite cake. “Then, why is it red?” He stuck his buck-toothed, freckled face in mine. “It’s food coloring!” I snapped. “It’s just too weird,” one girl said to me apologetically and shrugged. I was horrified to see half-eaten and uneaten cupcakes dumped in the trash. What was the matter with these kids? My mother had slaved over three dozen cupcakes for nothing. I felt bad for her. I felt bad for myself, and then I saw several untouched cupcakes left in the box for me, me, me! Ten years later, the Soviets released a study that concluded that Red Dye No. 2, whose common name is amaranth, was a carcinogen. Responding to public outcry, the FDA began its own study, which concluded that, in high dosages fed to female rats, there was a significant increase in the number of malignant tumors in the rats. It was banned in 1976. I prefer a good French buttercream or my faux French buttercream frosting made with hot milk and granulated sugar, because I’m not a cream cheese frosting fan. I find that the tang of the cream cheese clashes with the almond flavoring in the cake, and, if the cake is made traditionally with buttermilk and the vinegar-baking soda mixture, it doesn’t need any more tangy-ness. In my so-called research, I found Red Velvet cupcakes frosted with almond-flavored cream cheese that might be tolerable, but I’d still rather have the frosting that my brain and stomach tell me belongs on Red Velvet cake. Why mess with perfection? My Sister made me a Red Velvet Cake for my birthday yesterday because she is The Best Sister Ever. 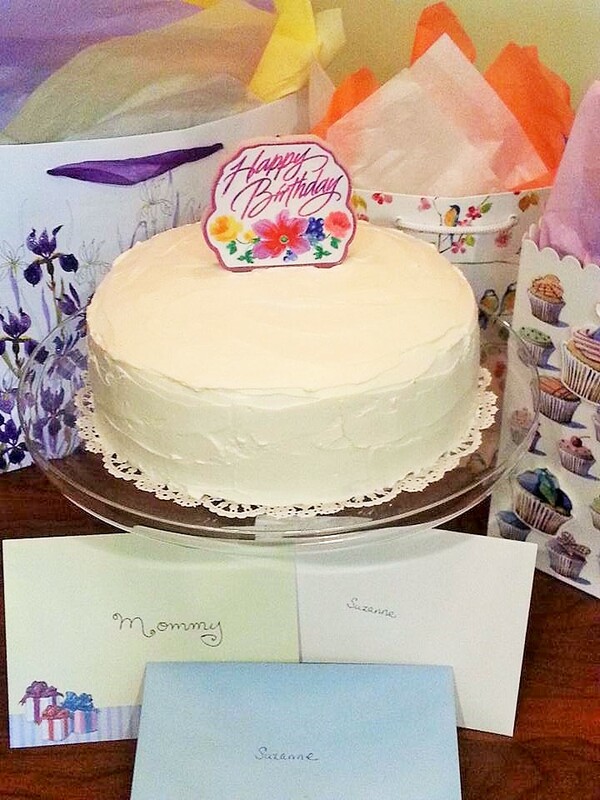 The cake was soft and tender; the frosting did not have a single crunch of undissolved granulated sugar (my biggest challenge in making that frosting). And I had a big giant slice of perfection for breakfast this morning, also a family tradition. After all, there are no calories on your birthday or the morning after, so, who am I to complain? Life is good (mostly). Soli Deo Gloria! Grease three 8” or two 9” cake pans with butter and line the bottoms with buttered parchment paper. Set aside. In a separate bowl, sift together the flour and salt. Set aside. In a large mixing bowl, blend food coloring and cocoa to form a paste. Add the shortening and sugar, and cream thoroughly. With mixer running, add eggs one at a time until blended. Mix in ¼ of the sifted flour mixture, alternating with ¼ cup buttermilk. Stop mixer and scrape bowl and beaters. Continue adding the remaining flour, alternating with the remaining buttermilk, beating thoroughly and scraping the bowl and beaters after each addition of buttermilk. It’s important that the flour doesn’t clump into ugly white blobs in your pretty red batter. Stir in the vanilla and almond extracts. In a small bowl, stir together the vinegar and baking soda and then stir the mixture into the batter. Pour batter equally into the prepared cake pans. To decrease the number of large air bubbles trapped in the batter, run a sharp knife in an “s” shape through the batter in each pan. Lift each pan about 1” off the counter and let drop onto the counter. The larger bubbles will rise to the top and either break or can be broken with a toothpick. Place pans in preheated oven and bake 30 minutes. Insert a tester (toothpicks work just fine) into the center of each layer. If it does not come out clean, bake another 5 minutes and retest with a clean tester. In my oven, an 8” layer is usually done in 30 minutes. The thicker 9” layers may take an extra 5-10 minutes. But be careful that the edges of the cake don’t become brown. When tester comes out clean, remove pans from the oven and place on a wire rack. Let cake layers cool in the pans for 10 minutes. You should see the cake’s edges pull away from the pan as it cools. If not, gently run a plastic knife around the edge and wait 5 more minutes. Place another cooling rack on top of the pans and flip. Remove pans from the layers and the parchment from the cake and cool completely. Frost with your favorite white frosting. CAUTION: I always lick the bowl and beaters, because I’ve been doing it for over 50 years, but it makes my mouth really red. It also might give me salmonella, if the raw eggs in the batter are bad. I don’t worry too much about it. The red dye probably will kill me first. Categories: Food, Mothers & Daughters, Now & Then, Recipes, Uncategorized | Tags: Baby Boomer humor, Cooking, food, Red Velvet | Permalink. Soaring through life on a wing and a prayer. © Suzanne Zantop and Every Girl Needs a Greek Chorus, 2014-2019. Unauthorized use and/or duplication of this material without express and written permission from this blog’s author and/or owner is strictly prohibited. Excerpts and links may be used, provided that full and clear credit is given to Suzanne Zantop and Every Girl Needs a Greek Chorus with appropriate and specific direction to the original content.